The Invitational is CrossFit's all-star game, with the fittest men and women from each section of the globe coming together to compete. 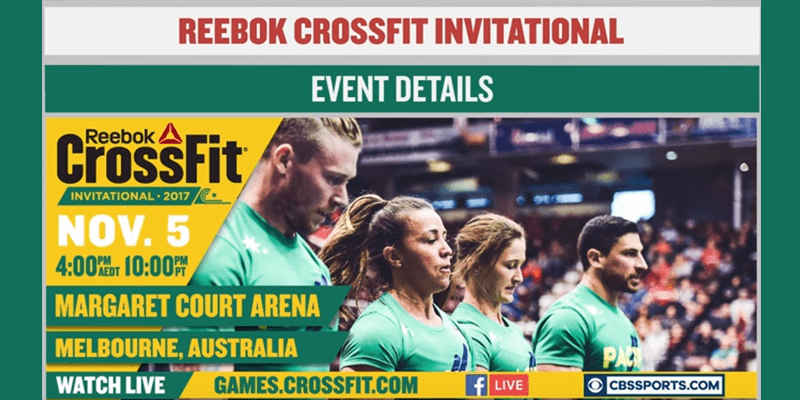 The 2017 Reebok CrossFit Invitational will be held at 4 p.m. AEST, Sunday, Nov. 5, at the Margaret Court Arena in Melbourne, Victoria, Australia. 7:00 – CEST Berlin, Germany, Hungary, France etc. 1:00 – EDT Albany, NY, Pennsylvania, Massachusetts USA etc. 00:00 – CDT Nashville, TN, Mississipi, Wisconsin USA etc. 8:00 – EEST Romania, Bulgaria, Finland etc. The two-hour competition will be streamed live to Games.CrossFit.com. Additional coverage will also be available on the CrossFit Games Facebook and CrossFit Games Instagram pages throughout the weekend. The only team with the coach who also competes is composed of two fittest woman on Earth Toomey and Webb and 26th-place finisher and perennial Games athlete Rob Forte. The Pacific Team’s 2017 roster is identical to its 2016 roster, with the exception of the coach. Chad Mackay coached the team to a third-place finish in Oshawa, Canada, last year. Pearce brings her unmatched gymnastics talent to the team, while Reed-Beuerlein contributes raw strength and incredible agility. Panchik and Ohlsen have finished in the top 10 at the Games six and three times, respectively, and Coach Neiffer will bring his team experience and his background in coaching to the competition. Two Icelandic outstanding athletes and two fellow countryman will compete alongside the rookie Jason Smith on the Europe Team. In addition, Briggs coached the Europe Team in 2015 and 2016. Team Canada coached by 2014 Games champion Camille Leblanc-Bazinet will be armed with Alessandra Pichelli and Carol-Ann Reason-Thibaultt finished 11th and 15th, respectively, at the 2017 Games. Canada West’s Brent Fikowski and Canada East’s Patrick Vellner finished second and third. The Canada Team was close to taking the title in 2014, but fell to the USA Team by just 3 points. Like in past years, CrossFit will host a friendly Affiliate Competition on Saturday, Nov. 4., allowing fans a chance to compete before they watch the Invitational.